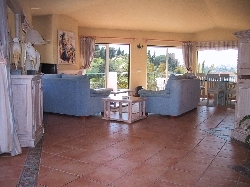 Welcome to our selection of holiday rentals in Ferragudo. Ferragudo is a small quaint fishing village opposite Portim�o across the Arade River. Less known and much less busier than its neighbour, Ferragudo is nonetheless still an attractive unspoilt gem of a holiday location. Its many cobbled narrow streets and whitewashed houses make up the village's typical Portuguese nature with people to match. The riverside has seen growth over recent years due to tourism but remains authentically Algarve. The only real time that you can see the influx of tourism in Ferragudo is during the summer months where the town square becomes quite popular at night with many parties happening and everyone is invited. Tourism is becoming increasingly prominent in Ferragudo but it continues to pride itself on retaining its traditional identity. The locals and visitors alike enjoy Ferragudo for just being able to relax in the charming laid-back atmosphere that the village is known for. It is never crowded wherever you go so feel free to enjoy the golden sands of the beach, enjoy a drink in the village square or watch the local fishermen go about their business. Being a fishing village, it is expected to see many fish restaurants and Ferragudo does not disappoint; either in number or quality. However, Ferragudo also offers a wide variety of other great restaurants too if you fancy a change from fish and seafood. There are a few small shops in the village selling souvenirs, fresh food and other necessities with more in Portim�o. The major shopping in the area is just out of Portim�o in the retail park where you have a large choice of shops selling a wide variety of goods. One of the village's most significant structure is the 17th century fort of S�o Jo�o de Arade that was originally a 15th century lookout tower. It is now privately owned by a famous Portuguese poet who has modernised the fortress to become his home and so is not open to the public. It is still an imposing looking fortress that stands out against the whitewashed buildings in the village and is well worth seeing up close for anyone who visits Ferragudo. It is said that it reminds some who have seen it as an over-sized sandcastle but that remark should not diminish its relevance to the village. The other most significant location here is the church. Overlooking the village upon a hill, the church offers some great panoramic views of the village and sea front. Looking for self catering holiday accommodation in Ferragudo? Then below is a selection of holiday villas in Ferragudo and holiday apartments in Ferragudo that can be rented direct from their owners. You can either click on each listing for further details or you can use our search engine on the left if you are looking for something in particular.